Talk about the upcoming movie here! Share your real life encounters with the Cougar Cross Country team if you have some. I think the movie looks good, in a disney sort of way…to bad it will probably be a flop ive seen like 0 promotion for it. I will go see a running movie when/if Life at These Speeds comes out. Life at These Speeds is such an emotional book. A lot of the conflict is what goes on inside Kevin’s head. Pretty much no conflict is on the track. I don’t see this translating well to film. This looks like a good story that is inspirational. How many of you guys had coaches that were that kind of a father figure…trying to push and motivate even when times were tough? Sounds like this guy was a running missionary in a way. Sacrificing himself to see great things for his protégés. This is the kind of story that America needs right now, when big movements and powerful people are trying to separate and divide the country. Though I personally think it echoes greatly into his apathy towards running, I can definitely see your point. It will probably be a let down in both the box office and in terms of quality. Still excited nonetheless! Life at These Speeds is being made into a movie for real. Pleasantly surprised. I honestly can’t say I’m excited about McFarland. I may go see it if its well reviewed. I expect it to be yet another feel good movie about how through hard work and determination underprivledged hs kids overcome obstacles. Seems more targeted toward the hs demographic. I watched Unbroken online. It was pretty good. I’ll probably do the same with McFarland. I’ll PM you if I find anything. Being from the Central Valley I have had the pleasure of watching every McFarland crop from 2003 and on boss it up in XC season. Problem is that now, due to a ****ty decision by the Central Section commissioner, the school of 800 students has to compete against D1 schools with numbers that hover at and over 2000 students. They didn’t make it to state for the first time in many years and of course it had to be around the time this movie comes out. Jim Crichlow is a jackass. It’s not very often that cross country makes its way on to the silver screen. This is why I made a point of catching a screening of the Disney movie McFarland USA which opened in theaters yesterday. As a former competitor myself I thought it’d be good to share some thoughts and reactions I had and leave the door open for others to contribute. To start things off I am going to say that this is indeed an amazing story of triumph. 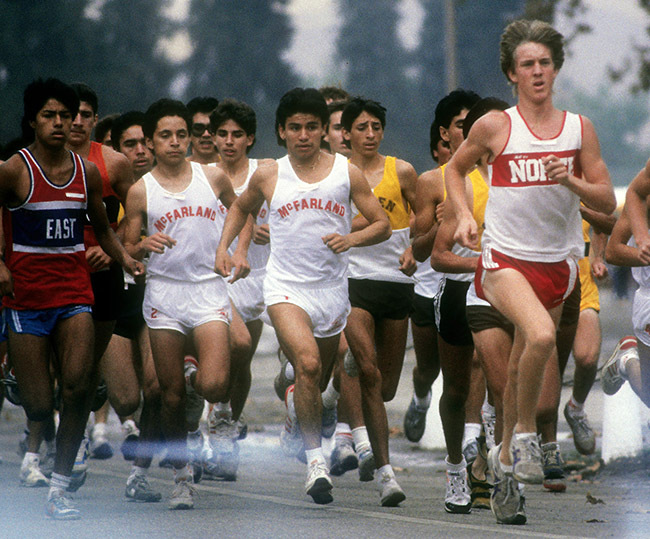 McFarland, a Mexican-American farming town of approximately 7000 in southern California, allocated its resources and rallied around their high school’s cross country program that defied all odds winning the CIF small school state meet in 1987. This began a long standing tradition of success for McFarland but while the movie is based on a true story it will irritate the competitive runner. It’s important for viewers with the distance running mindset to understand that this is a movie about race relations in rural California that happens to involve a cross country program. Not the other way around. What I mean by this is other than an extremely passive capture of what the sport involves it is not a true cross country movie. It is not a passion fueled chase for Olympic glory that Hollywood has given distance runners in the recent and distant pasts. Instead we see the story from the point-of-view of Coach Jim White, a displaced football coach who is fired from a suburban school district after some questionable locker room behavior involving an athlete who needed disciplining. He ends up taking a position at McFarland high school because he doesn’t have any other options and is essentially only hired due to the fact that the school faces similar constraints. Training and competition are only minimally shown throughout the flick. Cross country coaches and athletes will be outraged by the Disney touch packed full of cliches and corny humor. Without getting into Coach White’s use of kitchen timers as stopwatches and odometers as gauges for passer-by running speed we should discuss the unrealistic timelines and events. Starting with the school administration allowing for a cross country team to even exist, Kevin Costner walks into the McFarland athletic director’s office, slaps down a packet of information about the “first” CIF state meet and requests the opportunity to start the program. Moments later, after just some brief questioning he is given the opportunity. This is where coaching blood will begin to boil because athletic programs – big and small, rich and poor – would need a lot more justification (and revenue) to open their doors to a new varsity sport. Typically something like this would involve a district approval and a more timely protocol. Next, every cross country coach has to sell their sport and program at one time or another to convince athletes to join and they must do so within a set of restricted guidelines. It is plainly very unrealistic how this process was portrayed in the movie McFarland. For example, one cannot coerce students into joining their sport after saving them from an in-school reprimand (detention, suspension, etc.). It is just not realistic. Another example is barely qualifying out of their section for the state meet and then suddenly winning the thing. That takes at least a year to do, not a few weeks. In the climax of the movie, an overweight boy passes a lot of his physically more fit competition in the final stages of the state race. An experienced competitive runner will not buy into this and be somewhat disappointed. Everybody who has succeeded in the sport of cross country will fume at the gross injustices in the movie. In some cases these gross injustices will diminish their own achievement(s). One of the biggest misses I observed was the inaccurate portrayal of cross country as an after school activity opposed to a grueling varsity sport. Success at the state level in cross country requires a very dedicated lifestyle. In the movie there’s a lot of athletic “duct taping” going on which leaves the wrong, Mickey Mouse “you can do it” fist pumping impression to the non-runner. Another huge miss is that even though the hardworking, blue-collared farm culture in McFarland without a doubt primes its teenagers to be tough runners, unless you’re German Fernandez you’re not going to run 16:30 for 5000 meters after never racing before in your life. The story of miraculously “winning state” comes too easy in the movie and is a disservice to the other small school runners in California. Just because you have seven runners doesn’t mean you can realistically compete. This is a tough love story though. There are stereotypes and generalizations that follow the Mexican-American race; the gang subculture, the low-income situations, hard working families of pickers, etc. But from the cross country point of view it leaves a distaste in your mouth. Running fast in one of the power states – on top of talent – takes a lot of hard work. The Disney movie fails to capture this very dedication that is required to win and simply plays it off that anything – even miracles – can happen. Cross country is not a sport where you can generally outrun your fit competition when you’re noticeably overweight. Unfortunately, there are no miracles in cross country as you cannot overcome a lacking fitness level simply believing in yourself. Not possible. Contrary to all the negatives I took away from this movie, the one thing I really respected was the closing “where are they now” montage which indicates that many of the members of the 1987 state championship team are back in McFarland and are active role models to the youth. We took our team to see it on Friday (we were in Pocatello, Id. for the Simplot Games). I found it borrowed storyline elements from both Hoosiers and To Sir, With Love, and you could suspect(ha!) in which scenes liberties were taken from the true story for dramatic effect. I am glad that XC gets some exposure. The kids on the team liked it. Don’t know how much it will inspire new kids to come out for the sport. 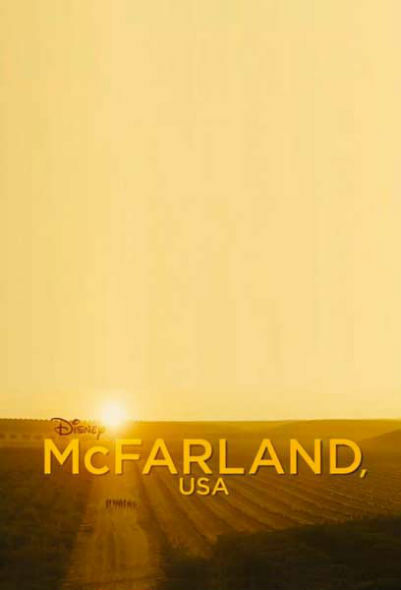 1st: McFarland is in Central California. The San Joaquin Valley (where I live) to be exact. We are in no way Southern California. 2nd: The stereotype of low income picking Mexican picking families is alive and well here, unfortunately. One of my old teammates, Eloy Quintana, is a coach at Madera South High School about 20 minutes north of Fresno and a majority of his kids work in the fields during the summer and/or have side jobs during the school year to help make ends meet at their houses. Rotten Tomatoes currently has the like ratings at 77/91%. I guess we can be overly critical of the accuracy of the movie because we were competitive runners or we can enjoy it for what it was – a feel good, inspirational Disney flick. I remember 20-some years ago when “A River Runs Through It” came out and a lot of folks labeled it as a fly fishing movie rather than what it actually was – a poignant true story about the relationship of two brothers in Montana. Sometimes it’s better not to know too much.